According to Greek legend 2,200 years ago, a young boy named Taras was injured in a shipwreck, thrown into the ocean and was drowning. The boy's father, Poseidon, god of the sea, realized his son was in danger and sent a dolphin to rescue him. Riding on the dolphins' back he was taken to a protective harbor which was named Taras in his honor. 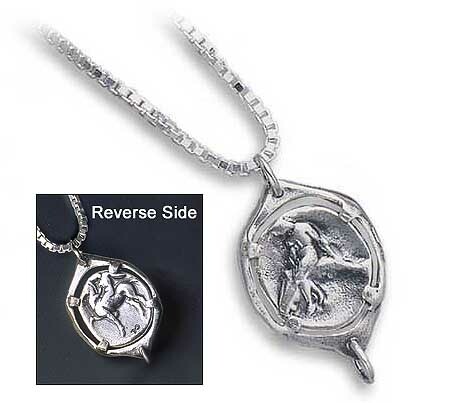 The reverse side of the coin portrays a naked youth on horseback. 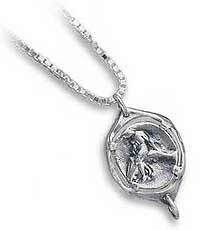 This stunning sterling silver necklace is an exact replica of the original coin used between 300 and 225 BC.